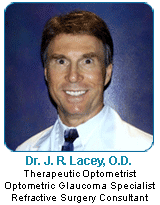 Dr. J. R. Lacey is a licensed therapeutic optometrist and optometric glaucoma specialist with a special interest in refractive surgery and contact lenses. He was one of the first eye care practitioners in the Austin area to offer PRK and LASIK as vision correction options to his patients. In 1994 he began co-managing patients with Dr. Stephen Slade, international refractive surgery expert and the first doctor to perform LASIK surgery in the United States. Dr. Lacey was the first doctor in the Austin area to offer Intacs and Conductive Keratoplasty to his patients. Extensive reading on refractive surgery management, diagnosis and treatment/prevention of complications (approximately 50 hours annually), Journal of Refractive Surgery, Ocular Surgery News, Ophthalmology Management, etc. Pathways in Practice Course by Allergan.